CURAD A&D ointment is a petrolatum and lanolin-based ointment that has vitamin A & D in it to help soothe, protect and moisturize the skin. 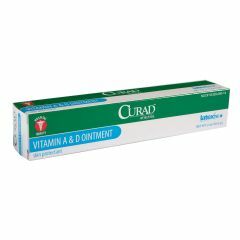 Inactive: corn oil, light mineral oil, vitamin A, palmitate, and vitamin D.
AllegroMedical.com presents The CURAD A and D Ointment. CURAD A&D ointment is a petrolatum and lanolin-based ointment that has vitamin A & D in it to help soothe, protect and moisturize the skin. Active: white petrolatum 93.5%. Inactive: corn oil, light mineral oil, vitamin A, palmitate, and vitamin D.